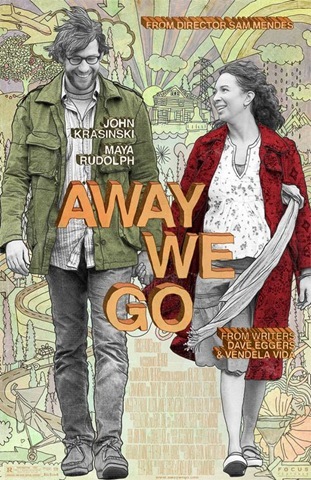 MOVIE REVIEW: Away We Go – An Unintentional Odyssey In Search of Home! Burt [John Krasinski] and Verona [Maya Rudolph] are six months along the road to having their first child when they learn Burt’s parents, Gloria [Catherine O’Hara] and Jerry [Jeff Daniels], are moving to Brussels a month before their grandchild is due. Since they moved to be nearby the grandparents-to-be, this causes unexpected turmoil – but Gloria and Jerry’s selfishness inspire the couple to seek a better place to raise their daughter. Since they both have good jobs that they can do over a phone, they can live wherever they want – so they pick a number of possible places, places where they at least know someone, and set out. Phoenix, Tucson, Montreal, Miami – each place they visit provides them with a good reason to move on. Finally, they settle on a place that is simultaneously a surprise and seemingly inevitable. That’s pretty much it for plot. What makes Away We Go such an interesting experience is the people Burt and Verona encounter – each is someone at least one of them knows and they all produce compelling reasons for the couple to move on. If it isn’t the world’s worst mom [Allison Janney], for whom Verona once worked, then it’s an old friend of Burt’s [Maggie Gyllenhaal] who has become the absolute worst example of old hippie-dom, or an adoptive couple [Melanie Lynsky and Chris Messina] with a seemingly happy, multi-racial family with only one [major] problem]. Away We Go is a kind of delayed coming-of-age story and Burt and Verona go on a road trip that is also an allegory for that coming of age process. Before they reach a decision on where to live, they have a series and make a series of promises. Their promises arise naturally from the situations they’ve encountered on the road and mark their passage into a new maturity that makes the final scenes as deeply moving and profound as any you’ll see in a movie this year. For them, coming of age is that shift between impoverished student and well off – but not standoffish – adult. Like any good road trip, Away We Go moves along with occasional shifts in pace and tone as each new destination brings, then undercuts hope. Krasinski and Rudolph give natural, unassuming performances that really allow us to accept Burt and Verona as the intelligent, searching characters that they are. The script, by Dave Eggers and Vendela Vida, makes time for each encounter to develop in its own unique way – and director Sam Mendes not only understands the material, but presents it in such a way as to draw us in fully. He seduces us with these smart, caring characters that go from being more than a bit lost to finding themselves and holds our attention by allowing them to grow on us as they grow themselves. The film is also greatly enhanced by the inclusion of a number of songs by Alexi Murdoch, who sounds like a perfect blend of Nick Drake and early Al Stewart [not as easy as it might sound]. Previous PostMOVIE REVIEW: Year One is a Level 0Next PostTVonDVD: Parker Lewis Can’t Lose! No, Really!